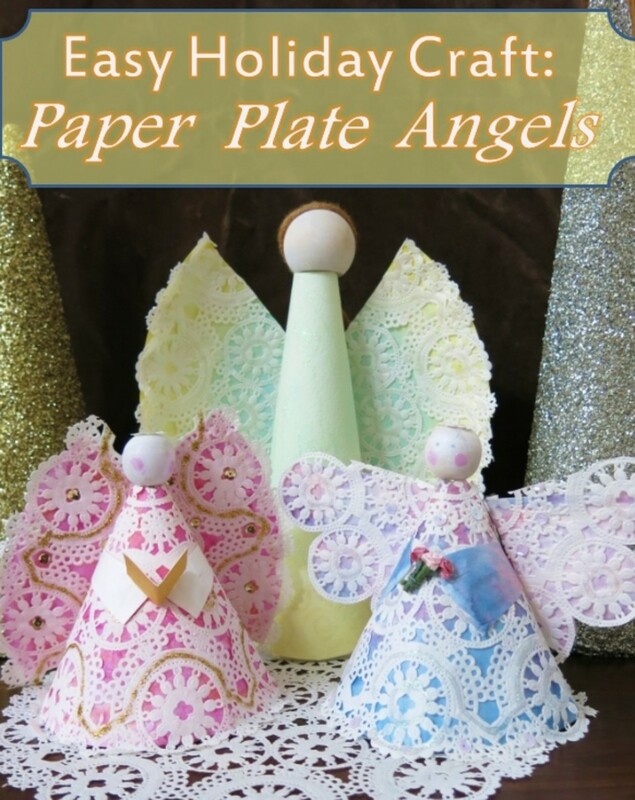 These colorful angels are made from a simple paper plate, a lace doily, and some basic art supplies. 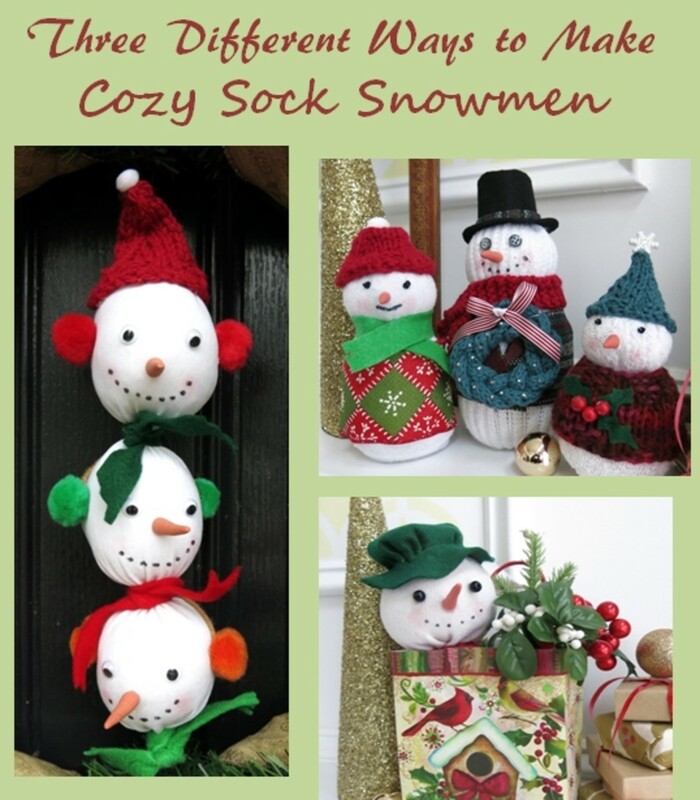 This easy holiday craft is a fun activity for crafters of any age or artistic skill. 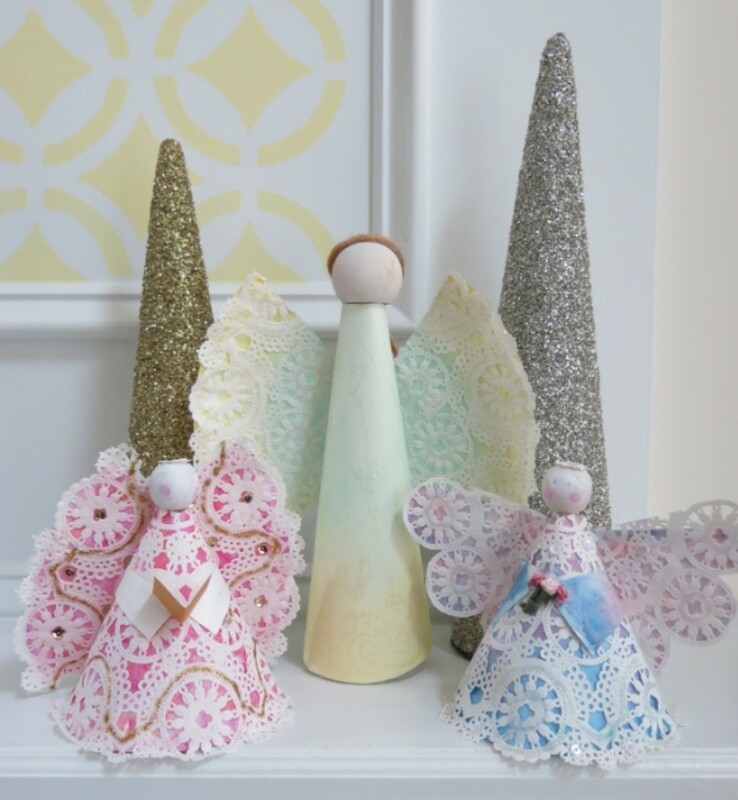 Once completed, your angels can decorate your mantle, hang on your Christmas tree, or serve as a tree topper. This easy project can be used as a fun activity while you're waiting for holiday cookies to bake, for a Sunday school class or Girl Scout troop, or at a family gathering. And this is not just a craft project for children. 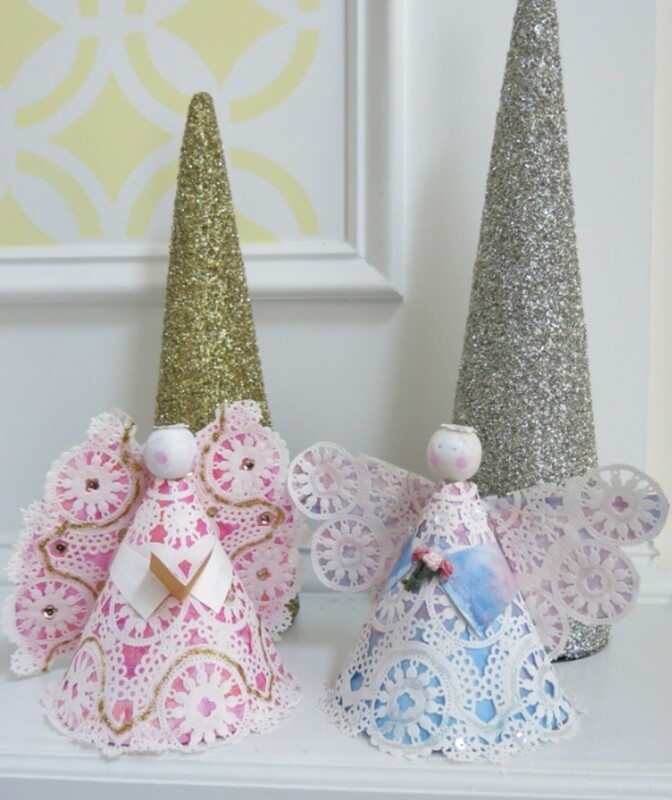 I designed these angels for my mother's women's group. They are making these angels to deliver with hot meals from their local church and to decorate trays at a nearby nursing home. a basic uncoated paper plate - these are the thin paper plates that I hate eating off of, but are great for this project. 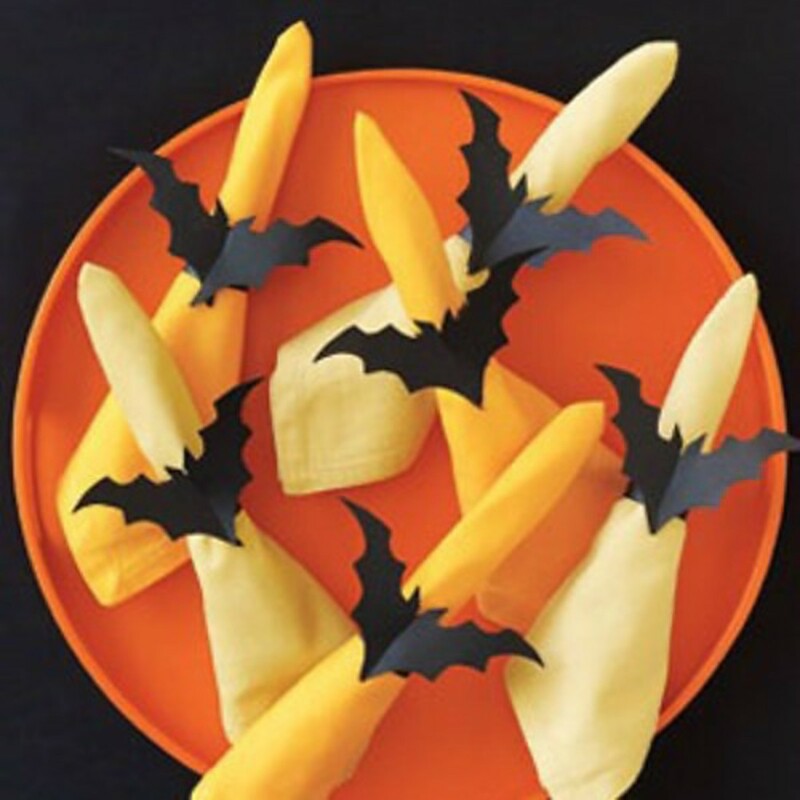 If you don't have any paper plates, or if you want to make a larger angel, you can use a thick piece of watercolor or construction paper, or poster board. 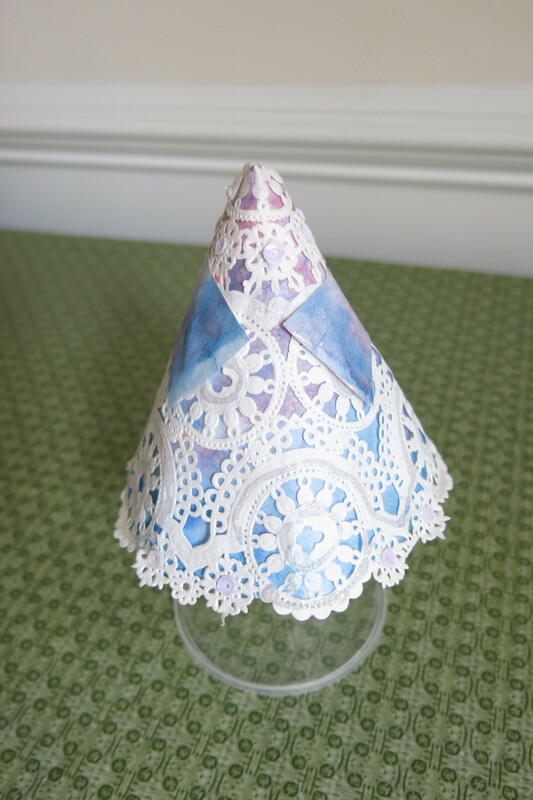 a lacy paper doily - this is optional, but adds decoration to your angel. Your doily does not need to be the same size as your plate - it can be a little bit bigger or smaller. 1. 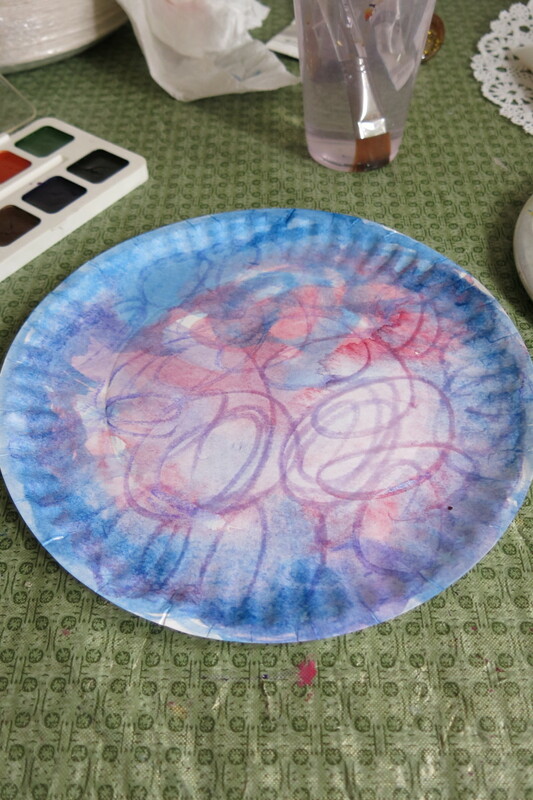 Start by painting or coloring your paper plate. There's no method in doing this, just layer on whatever colors you want to use, in any pattern you choose. It does not need to be pretty or fancy. I have some fun watercolor techniques posted here that you might like to try. The only rule is to be sure to cover all the edges with color. As you work, your paper plate might flatten out some. This is fine. 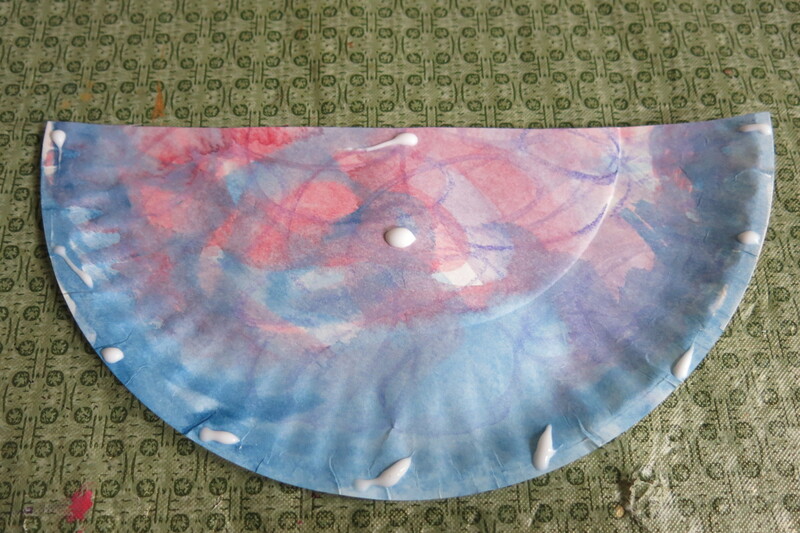 I used a mixture of watercolor and crayon on my plate, in no particular design. I just decided to use purple and blue for my angel. 2. 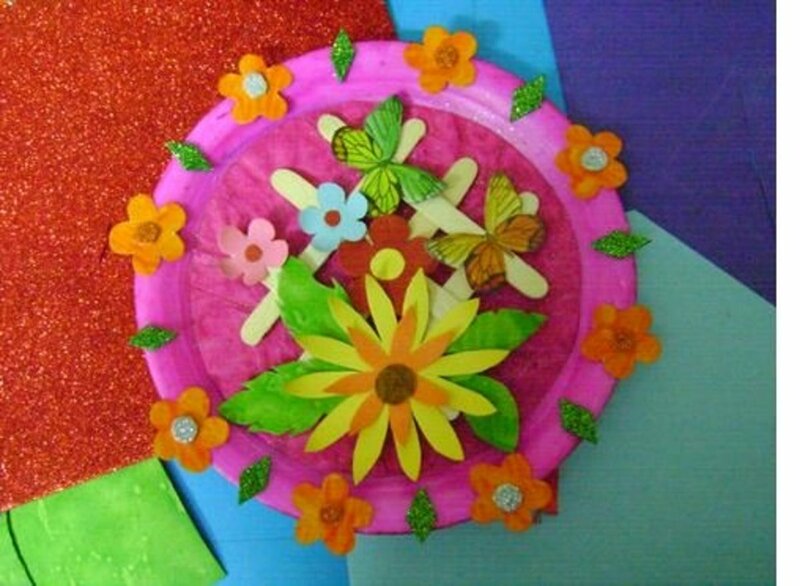 While your paper plate dries, begin to decorate your doily. I used glitter glue to trace some of the design on my doily, and then glued on a few sequin for some additional sparkle. 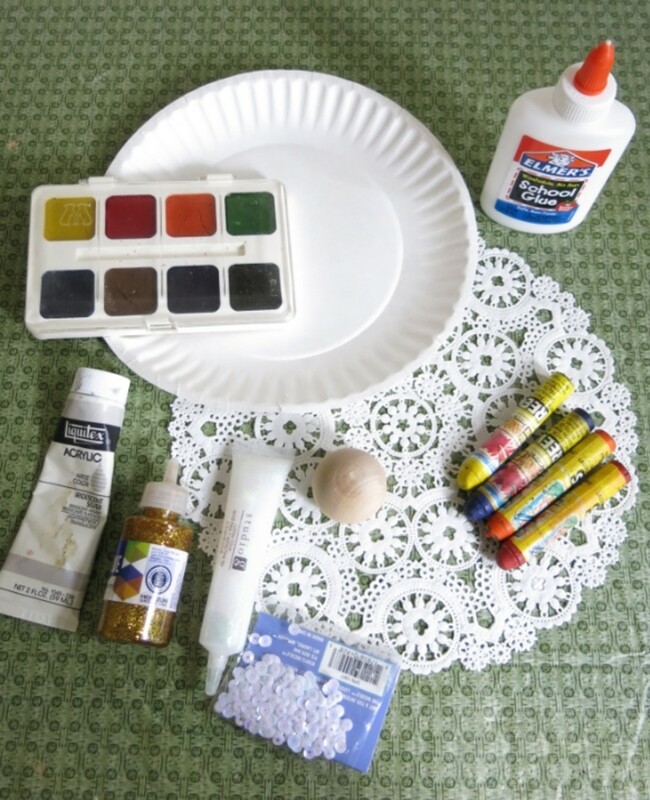 You can also use beads or buttons to embellish your paper doily. 3. Once your paper plate is dry, cut it in half. Then take one of your half pieces and cut that in half again as shown above. 4. 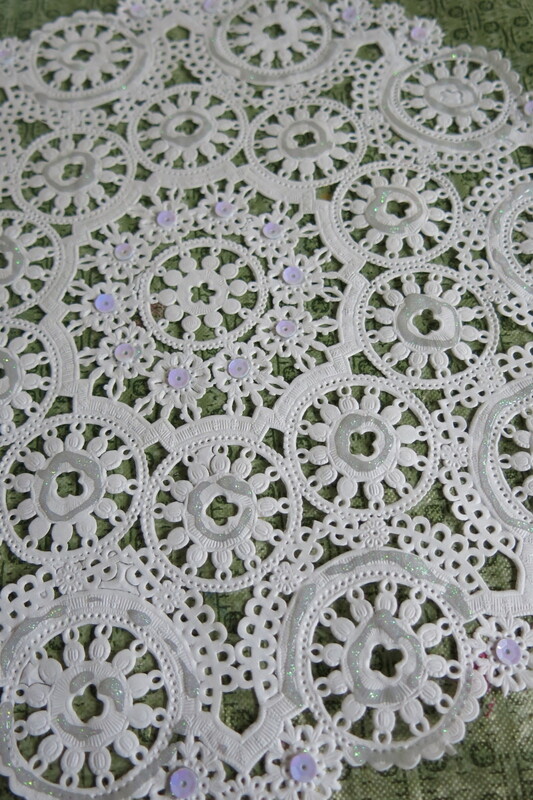 When dry, cut your paper doily in the same manner. The pieces of your doily do not need to be the same size as the pieces of your plate. 5. 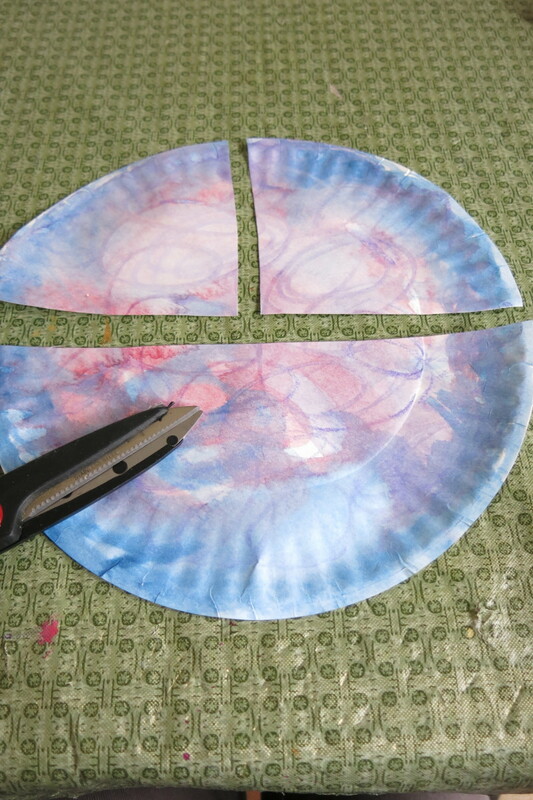 Taking the half piece of your paper plate, put a small dot of craft glue all around the edge of your plate. You do not need a lot of glue. 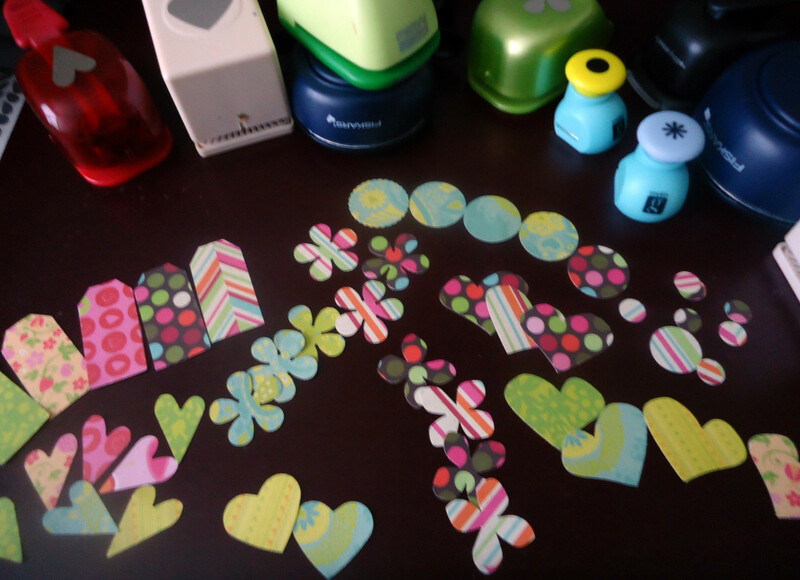 You can also use small pieces of double-sided tape for this step. 6. Now put the half piece of your doily over the half piece of your paper plate as shown above. This piece will become the body of your angel. Your doily can hang over the edge of your plate, or be shorter than the edge. This will just create a different design on the body or dress of your angel. Then put these two pieces aside to dry. 7. 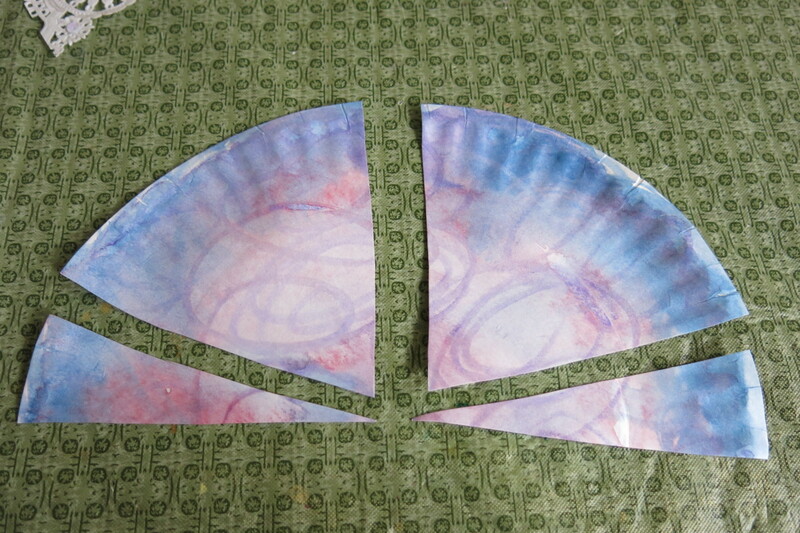 Take your two remaining pieces of paper plate and cut a small equal sliver (like a small piece of pie) off each one. 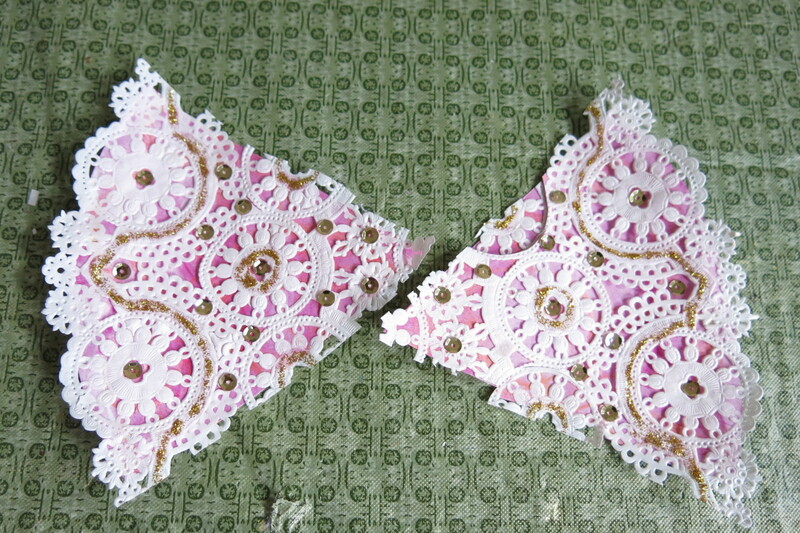 Do not cut anything off your pieces of doily. 8. 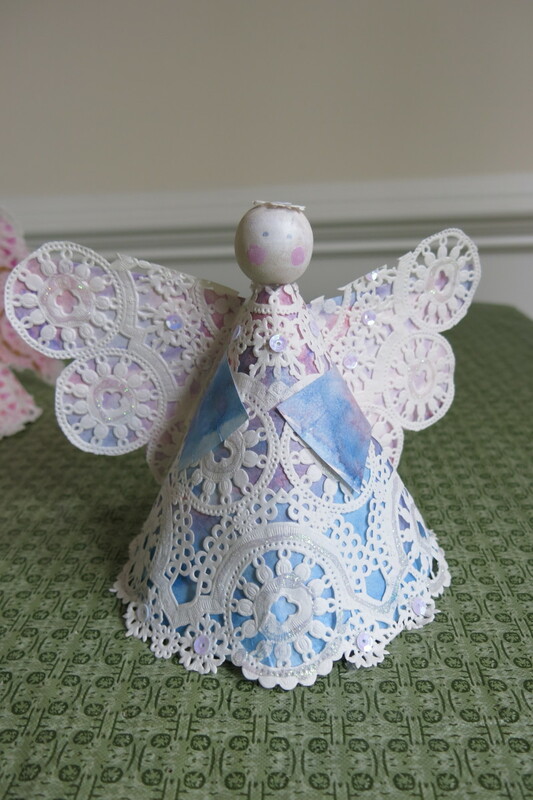 Take your two remaining pieces of doily and glue them down on your two bigger pieces of paper plate using the same method used for the body of your angel. These two pieces will become the wings of your angel. If you wish, you can add more glitter or decoration to these pieces. I glued more sequin on to my wings. Then put these pieces to the side to dry. 9. While your angel wings dry, take the body half of your angel and shape it into a cone. Use glue or tape to hold the two edges together in the back. 10. Then take the two smaller pieces of plate and glue them on to your angel body to look like arms. You can glue these pieces on with either the painted side showing or the bottom of your white plate showing (I did one of each in my samples). You might need to trim the length of these arm pieces a bit on the back side. Place these pieces on the body so the edges of the sleeves come together in the front of your angel. Then let these pieces dry. 1. You can leave your ball or bead in its natural state or paint it with a skin tone. 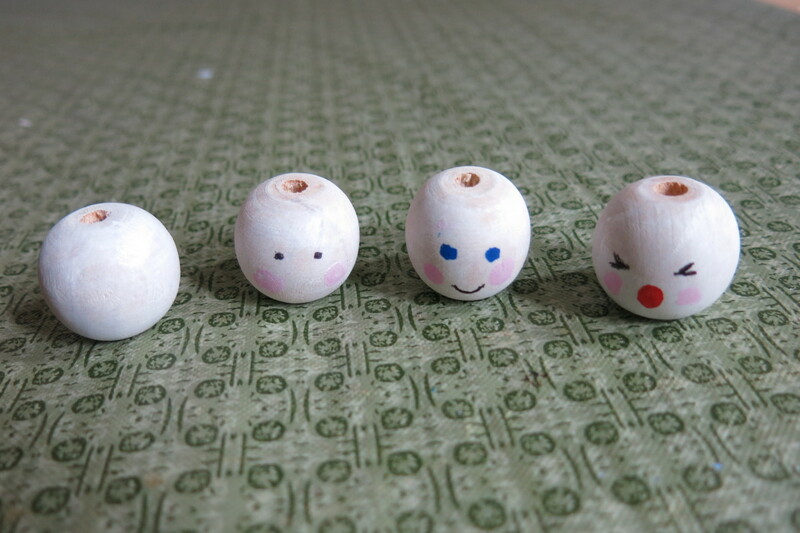 I gave my wooden bead a light wash of white paint. 2. You can leave your angel with no facial features. This is not unusual on angel figurines. 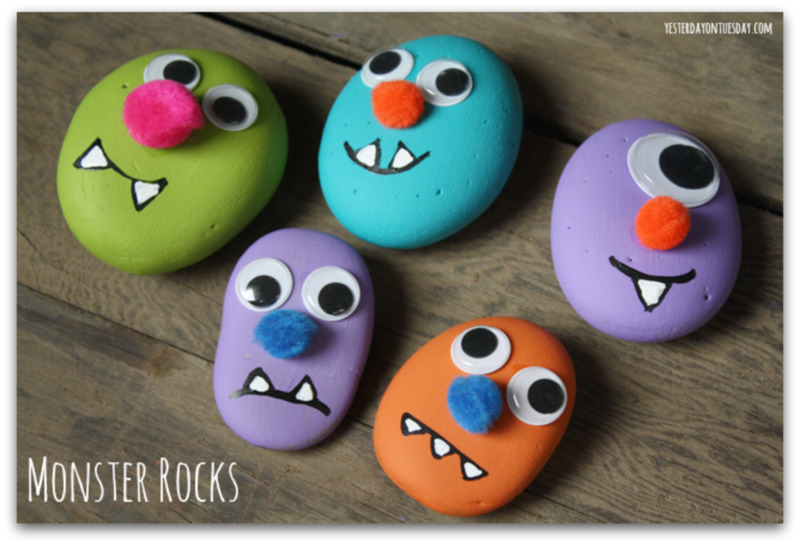 Or you can add some features with paint, fine Sharpies or colored pencils. I made a few sample heads. On the left, I just gave the head a light wash of paint. On the next head, I used a Q-tip to put two dots of pink paint on the cheeks and used a fine Sharpie to add some eyes. The next head, I used a regular Sharpie to make some bigger eyes and a fine Sharpie to draw the smile. On the last head, I drew the eyes as if they were closed with eyelashes and the mouth as if my angel was singing. On my finished angels, I decided not to draw any facial features and to just add two dots of color on their cheeks. Then I glued on a small piece of doily to the top of the head as a halo. 1. Once all your pieces are dry, you can glue or tape the wings on to your angel. You may want to trim your wings before attaching them to your angel body. 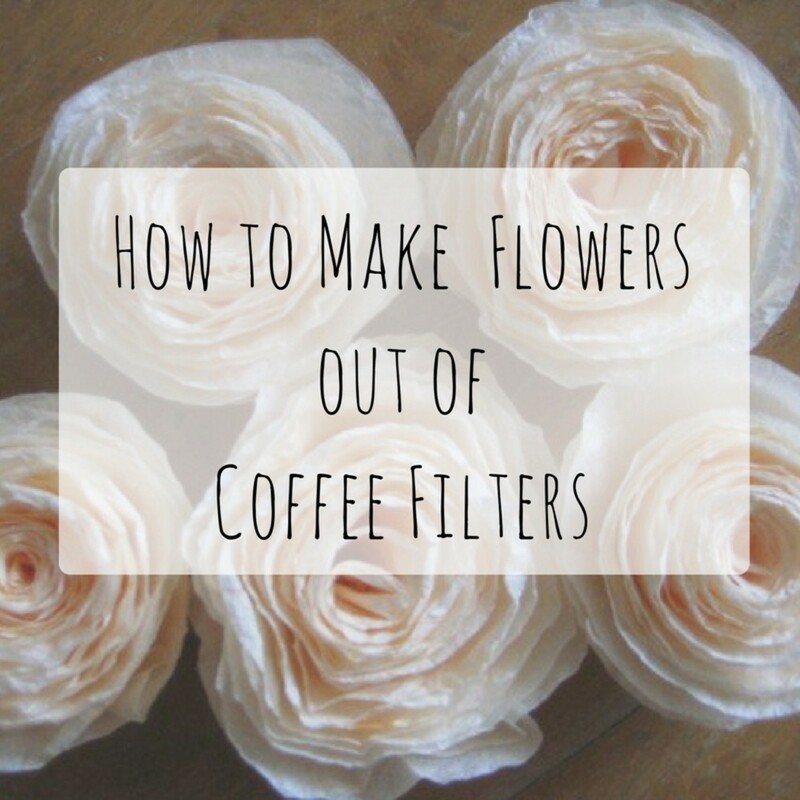 This is optional, but you may want to shape them more like butterfly wings, or follow some of the design in your doily. 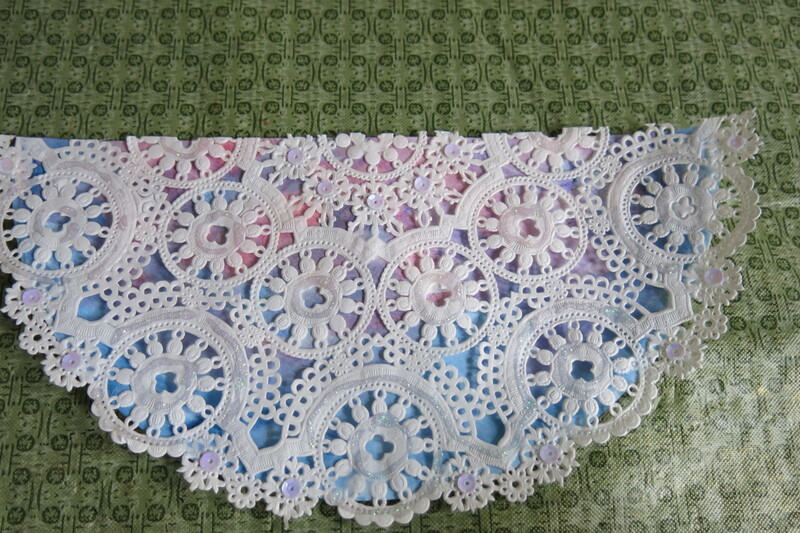 I cut my wings down to follow the round shapes in my doily. 2. Using white glue or hot glue, adhere your head to the top of your cone. You may need to trim the top of your cone a little bit for your angel head to sit level. 3. If you'd like to use your angel as a tree decoration, tape a loop of ribbon or fishing line to the back of your angel (between the wings) to use as a hanger. 4. If you angel will not stand straight on its own, place it over a plastic or paper cup to add stability. You can trim down your cup so it doesn't show under the body of your angel. 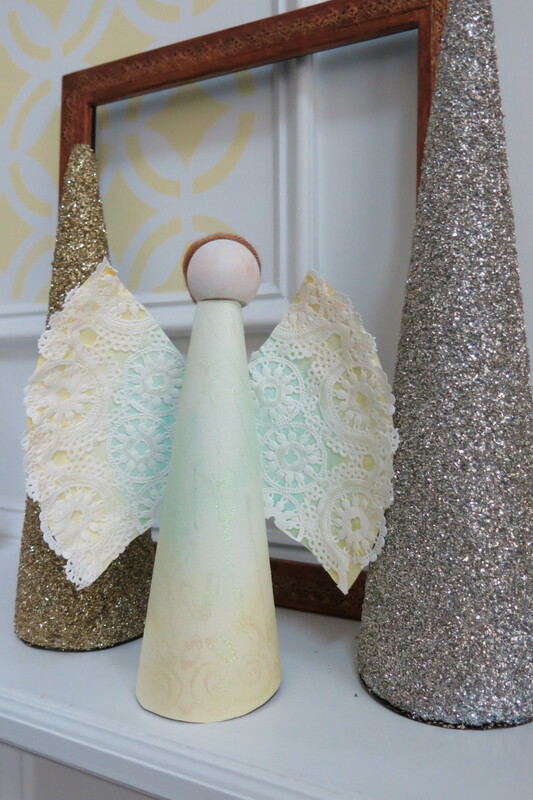 You may also want to add a cup under your angel if you plan to use it as a tree topper. The cup will add extra thickness and shape to your angel for sitting on your tree. 5. (Optional) You can finish decorating your angel by placing something in between the hands. I made a small book for one of my angels by folding a piece of gold paper and gluing it to the front of the body. 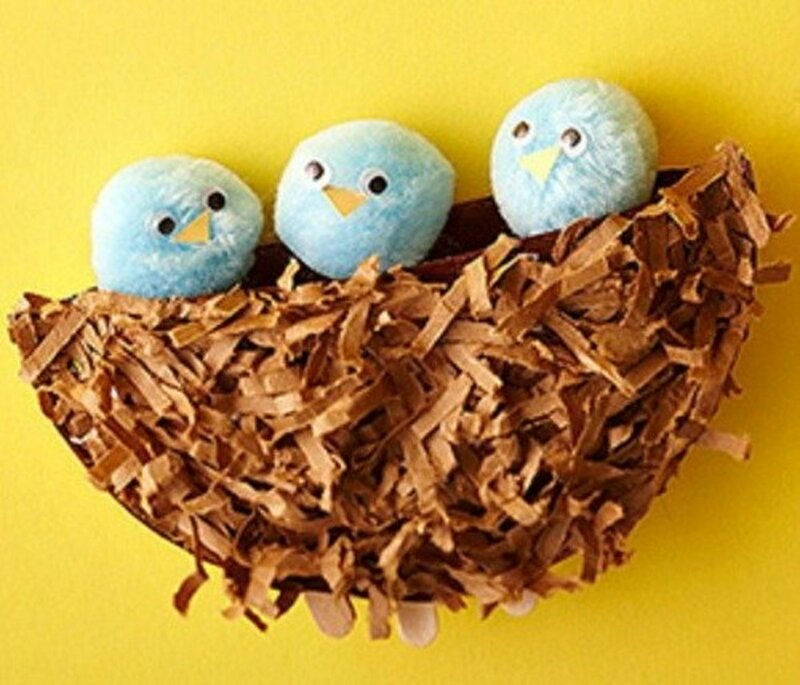 You could also place a cross, a small present, a small bouquet, or a decorative button in between your angel's arms. You can make a larger angel by using a larger piece of paper for the body. 1. I made a bigger angel by cutting a 15 inch circle out of a piece of thick watercolor paper. I still used a paper plate and doily for the wings. 2. I painted the body and paper plate with watercolor using the same colors for both pieces. 3. 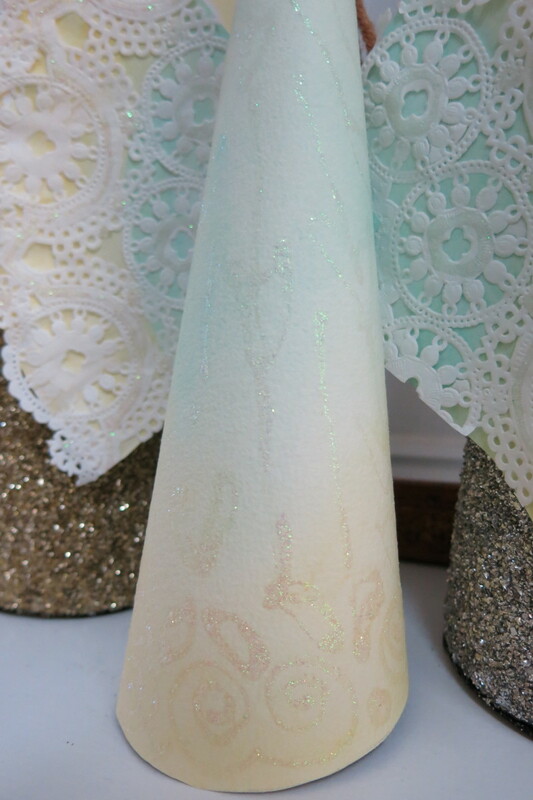 Once my paint was dry, I used my glitter glue to draw a design of swirls and leaves on the body section of my angel. I also used glitter glue to decorate my doily. 4. I used the same process as above to put together the pieces of my larger angel, but I chose not to add any arms. I wanted to make this angel a little bit more stylized and simple. 5. I used a bigger bead for the head, but didn't draw any facial features. Instead, I used some yarn to add hair and pulled it back to look like a ponytail. To add hair, I cut about 10 pieces of yarn that were each 7 inches long. Then I lined these up in a flat row. I used hot glue to make a line on my doll head that ran from the forehead to the back, like a part in the hair. I laid my yarn pieces evenly across my line of glue. Once my yarn was dry and secure, I pulled it to the back of the head and tied it with another piece of yarn (you could also use ribbon). Then I trimmed my yarn so the ends of the hair was even. Hi Rebecca - Thanks so much! I'm looking forward to using these angels in my holiday decorating. I think I might make a "heavenly host" of angels to fill my fireplace mantle. Hope you have a wonderful holiday season! Thank you for your comments and support! Very pretty and elegant. Awesome tutorial. Hi Maura and Katie! Thanks so much for stopping by and leaving such sweet comments. I appreciate it! Thanks, Rachel! I hope your class enjoys making these angels. I'm sure they'll have a lot of fun. Thanks so much for stopping by and commenting! Best wishes for a wonderful holiday season! 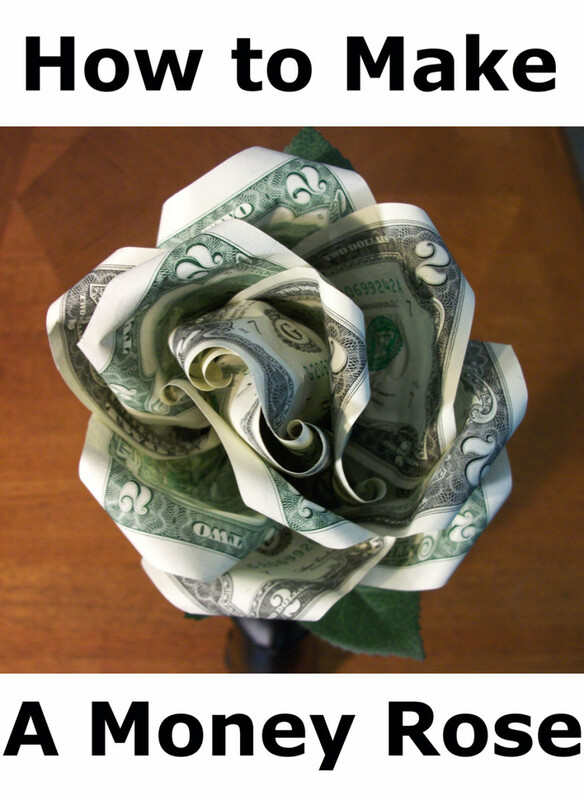 Hi Donna, what a lovely craft. I like different ideas for my little Sundayschool class and I always let them make angels for Christmas. Thanks for the idea. Hi Sally! So glad you like this project (I do too!). I appreciate your pass along and support! Thanks so much, as always, for commenting! Hi Kristen - Thanks so much for your kind comments. I think this is a great project for my mom's group. 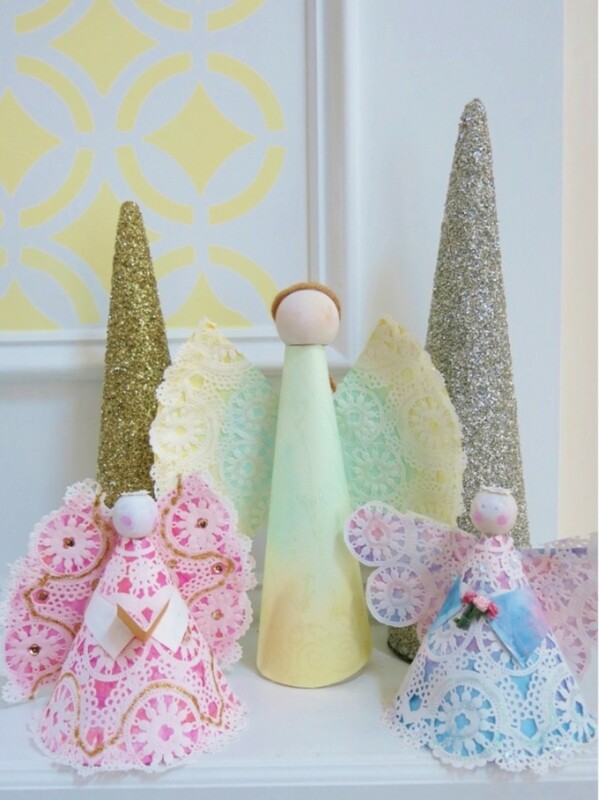 These angels are easy and inexpensive to make, but are really pretty when completed. I think the people at the nursing home and getting the meal delivery will really love them. Thanks for stopping by and reading. I appreciate it! That is so cute. I am going to pass this one over to my sister who will really appreciate an opportunity to make these, especially during the Christmas holidays. Thank you so much. Donna, I love your crafty ideas. This was real beautiful and easy to do. I think what your mother's group is doing is wonderful, too. I believe my mother made something like this a long tine ago for an angel ornament. I might still have it in my Christmas hodgepodge ornament. I would love to make this this year, too. Excellent hub!